Note: Depending on how many teachers and other staff will be using the HyperDuino system in your makerspace, we recommend purchasing additional single HyperDuino kits for those particular staff members. This is a good makerspace set that will give you 30 HyperDuino+Funduino units, 6 motors & servos, plus 150 sets of LEDs, touchpoints, and cables, enough for 5 classes of 30 students each. 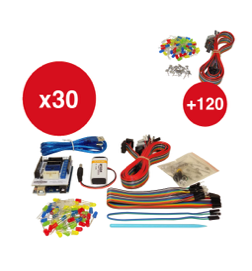 If you'd like to purchase enough for just 30 projects, see the HyperDuino Mini-Makerspace Set.